Three outstanding students who sat the Grade Six Achievement Test (GSAT) were awarded Secondary Scholarships by Rose Hall Development Limited (RHDL). 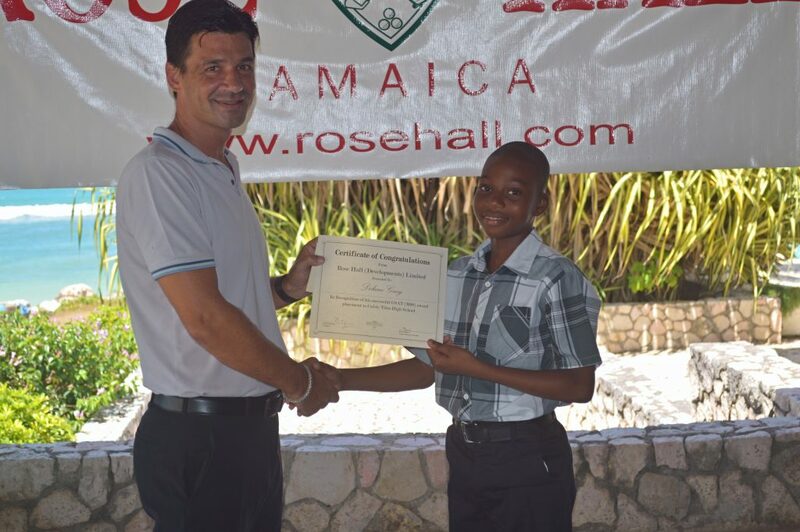 The scholarships are made available to the children of the Staff at Rose Hall Developments Limited and are valued at $25,000 per awardee, to assist with back to school expenses in their first year of High School. Since the start of the scholarships in 2016, Rose Hall Developments Limited has disbursed over a half a million dollars to students. In his address at the luncheon held on August 21, at the The Palms, Rose Hall; Rick Burrowes – Senior Director of Operations, expressed the importance of Education and giving back, that has been inserted into the culture at Rose Hall by the late John Rollins and his wife Michelle Rollins – Chairman of Rose Hall Developments Limited. “It is one of our proudest days when we see the youngsters do really well in their GSAT examinations. We know it’s not easy for parents, so this scholarship is our way of assisting and encouraging the kids to continue to do really well,” he said. Human Resource Manager at the company, Marcia Sibbles, commended the parents for their continuous sacrifices and commitment to aid in their children’s academic success. Erica Gray, staff at the Rose Hall Great House – thanked the company for their unwavering support to the staff and their children and expressed her appreciation on behalf of the parents of the awardees of the Rose Hall Developments Limited scholarship program. Rose Hall Great House Manager – Mrs. Angele Nunez-Rhumes (Right) and staff –Mrs. Erica Gray (left) as she closes her vote of thanks on behalf of the parents.